These School Holidays we have teamed up with Party Chameleon, the greatest kids entertainers ever to bring you 2 hours of non stop fun from 11.30am-1.30pm on both Wednesday’s of the School Holidays. 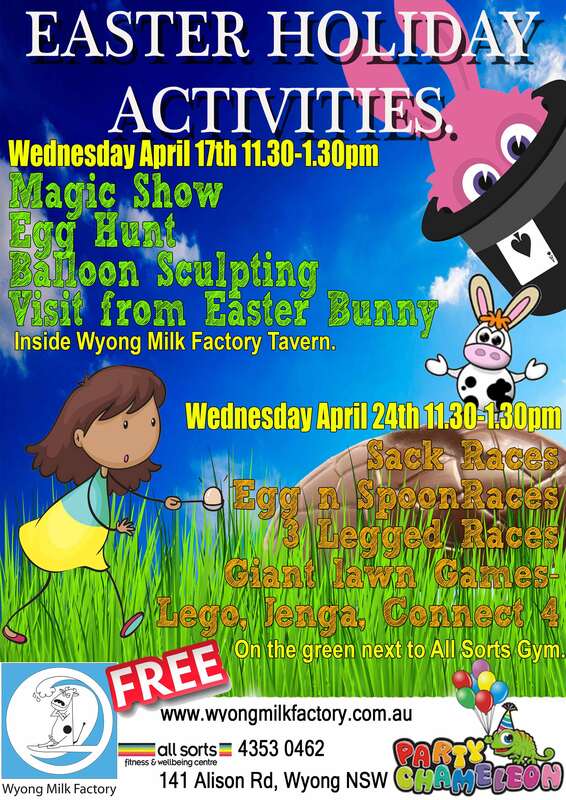 On Wednesday April 17th from 11.30am-1.30pm in The Beer Garden of Wyong Milk Factory Tavern will be having a Magic Show with a real life bunny! There will also be an Easter egg hunt, balloon sculpting and a special visit from the Easter Bunny himself! On April 24th 11.30am-1.30pm there will be an afternoon of lawn games on The Green outside All Sorts Fitness with 3 legged races, egg and spoon races, sack races and giant lawn games of Jenga, Connect 4 and Giant Lego!! Don’t forget kids eat free on Wednesday’s and Thursday’s!! Receive one kids meal per full priced adult meal. It’s going to be Egg-stravagent! Bookings are essential, phone 4353 0462. Where else would you rather be these School Holidays?